On the second day of Christmas, Australian Bush Flower Essences gave to me… Christmas Bell (Blandfordia nobilis). Traditionally, the Christmas season promises to be a magical time of year, but for many people that concept is only the stuff of legend. So, why not try something different this year and actually make the effort to bring some of that famous magic into your own Christmas season? Christmas Bell Essence is like that pinch of fairy dust needed to bring all your wishes to life, so let’s get started on how you can use this Essence to manifest the perfect Christmas – and then the life you have always dreamed of! 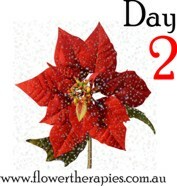 Since Christmas Bell Essence is the Australian Bush Flower Essence that deals with helping you manifest your heart’s desires (see yesterday’s post for why you also need open your heart to manifest*), it can be used to help you create the type of Christmas season you have always dreamed about, yet deemed impossible. As the name might suggest, Christmas Bell quite appropriately flowers at this time of year, suggesting it is able to help us with all issues related to Christmas: manifesting your Christmas wishes; helping you to better appreciate the things you have already been given; finding the gifts you want for yourself and loved ones; and helping you to receive all your desired wishes now. Christmas Bell can help you to manifest your heart's desires! Aside from assisting you to manifest your heart’s desires, Christmas Bell Essence also helps you to better value the things you already do have, rather than spending your energy noticing what is missing in your life. This is an important component in the manifestation process, as you can only manifest what you focus your mind on: if you are using all your energy to focus on what you wish you had, you will always be wishing for what you want instead of receiving and enjoying it. Instead, Christmas Bell Essence can help you to realise your wishes, by keeping your thoughts centred purely on what you know you will receive. Helping your children take better care of their gifts: Perhaps you are one of those parents who look on with horror as your children proceed to abuse and break their new Christmas gifts – before the New Year has even begun (or even worse, before you have even finished your Christmas pudding)? Christmas Bell Essence can help your children to become better custodians of their new Christmas gifts by appreciating what they are given, and realising that with ownership of anything comes responsibility. It can also be an especially useful Essence to give your children if you are considering buying them a new pet for Christmas, as it will ensure they understand that responsibility arrives hand-in-hand with the fun of owning a pet (but please do think carefully before giving pets to anyone as a gift this Christmas). Affording the gifts you want to buy: Maybe you are wondering how you can afford to buy the gifts you want for your loved ones? Christmas Bell Essence can help you to manifest the means with which to do anything your heart desires. So by taking this Essence and keeping in mind what you would like to buy for your loved ones, you are sure to find a way to buy, win or receive what you want for them, without much effort at all! Manifesting your new life: Here is an easy little visualisation exercise to get you started on manifesting your new life, while orally using Christmas Bell Essence (and if you don’t yet have a bottle of the Essence, you can focus your eyes and attention on the photo of the flower above for one minute to use the Essence ‘visually’ until you are able to buy a bottle): Picture a perfect Christmas tree in your living room, decorated as though it was taken straight from a Christmas card scene. Underneath this perfect tree is the most stunning array of beautifully wrapped Christmas gifts, and when you check closer, you see that all the tags have your name on them! As you pick up each present one-by-one and open it carefully, you see that each contains exactly what it is you want to receive in your life: whether it be the keys to a new car, a job acceptance letter, or a photo of your perfect partner. Once you have opened each of your gifts (make sure you open them all! ), place your hands together over your heart and say ‘thank you’ out loud for the wonderful gifts you have now received. Continue this small visualisation while taking the Essence twice daily throughout the Christmas season, right up until mid-January, and watch your gifts manifest in your life – right before your eyes! So on our second day, you hopefully can see that Christmas Bell is a wonderful Essence to help you draw into your life those aspects you have either felt were impossible, unachievable or just seemed too good for you to allow yourself to dream about receiving. Feeling inspired about the magic of Christmas Bell? Then you’d better get that letter to Santa all drafted and in the post NOW! Don’t forget to check back tomorrow for the third day of Christmas Essences (remember to subscribe so you don’t miss out on any of the Essences!). The Australian Bush Flower Essences combination, ‘Abund’, contains both today’s featured Essence, Christmas Bell, and yesterday’s featured Essence, Bluebell, so you can address both these aspects of manifestation along with other relevant issues at the same time.